Dimensions (HxWxD): 1.25" x 0.4" x 0.3"
This beautiful highly faceted triple gemstone Moldavite Pendant in sterling silver comes complete with a lovely sterling silver chain in its own black velvet jewelry box. 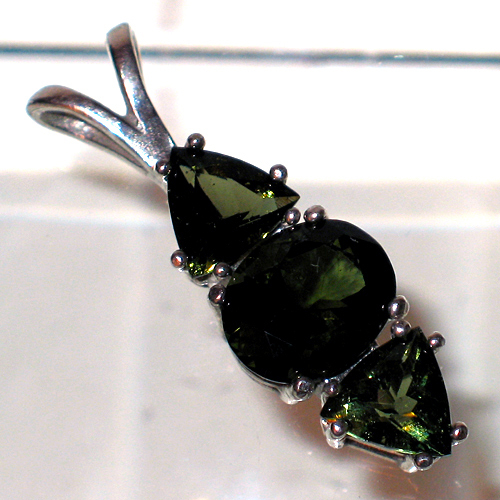 It has beautiful faceting which accentuates its deep green translucence. An interesting notched design in the sterling silver of the setting. See view below to get a sense of the facets. See our article "Using Quartz Crystals in Digital Technology, Healing and Meditation" for an overview of the metaphysical and mineralogical properties of quartz crystal. You'll find a guide explaining how to clean, charge and program your quartz crystals for use in healing and meditation, and you can also read about famous scientist and crystal healer Marcel Vogel's methods of crystal healing. Note: weight above is shipping weight. Net Weight is 5 gms.